Los Angeles Clippers center DeAndre Jordan shoots a free throw. In the 17 years since Don Nelson first urged the intentional fouling of Dennis Rodman in an attempt to stop the Chicago Bulls from scoring so many points, fans of NBA teams with big men who struggle at the free-throw line have come to rue the “Hack-A-Shaq” strategy. Proponents of uninterrupted basketball have decried it for ruining the flow of games, yet for teams facing Shaquile O’Neal (52.7 percent career FT shooter), Dwight Howard (57.4 percent), Andre Drummond (40.2 percent) and DeAndre Jordan (42.5 percent), it has remained an oft-used, and seemingly viable, strategy. Golden State Warriors coach Mark Jackson is one of its most ardent disciples. In 2012, Jackson famously helped Howard set the NBA record for free throw attempts in a game by telling his players to foul Howard repeatedly. Throughout his three years as a head coach, Jackson has done the same against Jordan and Drummond, and he’s carried the hacking strategy into this year’s playoffs. With three minutes left in Game 1 against the Los Angeles Clippers, the Warriors were up 100-97 and hacked Jordan, a 43 percent free-throw shooter this year. Even though Jordan made both free throws, the strategy earned the praise of preeminent basketball minds like Haralabos Voulgaris, a stats-driven basketball forecaster. The basic math of the “Hack-A-DJ” strategy goes like this: If DeAndre Jordan shoots 43 percent from the free-throw line, fouling him yields two shots and 0.86 expected points. Compare that to the Clippers’ average points per possession this season — 1.12 — and it becomes clear that an intentional foul strategy is, on its face, a savvy one. Except it’s not, once you factor in all the things that happen before and after a free throw.1 With a big data assist from ESPN’s Stats & Info group on the Clippers’ and Jordan’s performance over the past two seasons, my calculations make clear that Hack-A-DJ is not a clear-cut winning strategy. To stress-test the intentional foul conventional wisdom, I first broke down how many points the Clippers were expected to score on each possession. That number is 1.12 overall, but intentional fouls are usually given on half-court possessions. If a team fouls a player like Jordan who doesn’t have the ball while another player is on a fast break, it’s possible that the second player will still make a layup that counts for two points, and the free throws will then follow. This exact situation played out in a Kings-Clippers game last season, when Chris Paul made a layup as the Kings intentionally fouled Jordan. Once I limited the expected points per possession to half-court possessions only, the number dropped to 1.04.2 What was a 0.26 point spread between an intentional foul on Jordan and a regular possession is now 0.18. The advantage is still there, but it’s narrower. Intentionally fouling Jordan also helps the Clippers set their defense on the ensuing possession, which lowers the chances their opponent will score. To figure out how much that’s worth to the Clippers, I measured the difference between the points they allow on possessions after they shoot free throws versus the points they allow after non-free-throw offensive possessions. That difference was 0.04 points, in part because an intentional foul against Jordan ensures the Clippers won’t turn the ball over or allow an opponent to make a fast break after a missed field goal attempt. What was a 0.18 spread between intentionally fouling Jordan and letting the Clippers play on is now 0.14. 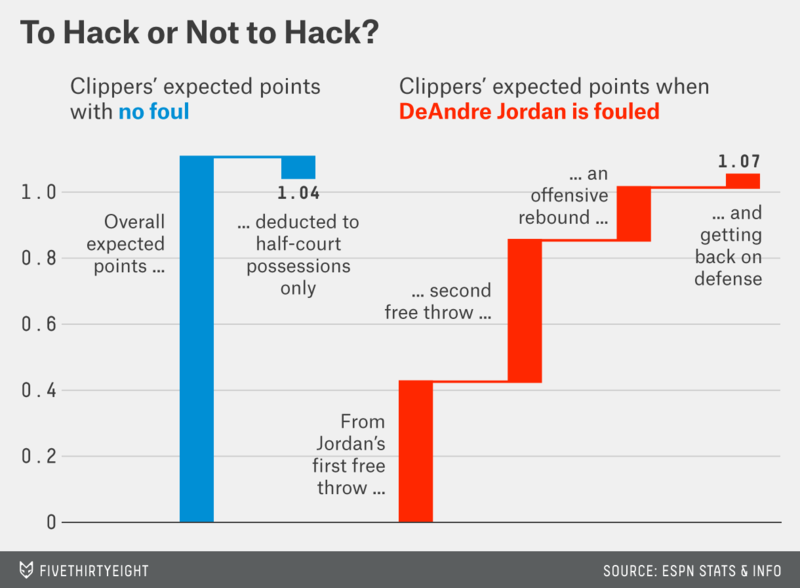 Finally, and most important, Hack-A-DJ is rendered inefficient because the Clippers are so good at rebounding Jordan’s missed free throws. Over the last two seasons, Jordan has missed 165 free throws with possible rebounds, and the Clippers have grabbed 34 of those rebounds, or 21 percent. That is nearly double the NBA rate of roughly 12 percent and four times the Clippers’ 4.8 percent offensive rebound rate on misses by players other than Jordan. While it’s impossible to know why LA shows such a remarkable ability to grab Jordan’s free-throw misses, it may have something to do with the team expecting a miss, and that the way Jordan misses somehow helping the offensive rebounders. Having Blake Griffin on the blocks can’t hurt, either. These rebounds are important because the Clippers are brutally efficient after corralling missed free throws. In 70 such attempts over the past two seasons, LA has scored 1.36 points per possession. It makes sense that teams would be efficient after missed free throws: The ball is already close to the rim, and the defense is likely in scramble mode, leaving perimeter shooters open. When we include the value of the Clippers’ offensive rebounding, the expected value of a Jordan missed free throw is 0.16 points. With his expected 0.86 points per two free throws, sending Jordan to the line actually yields 1.02 expected points for the Clippers. The gap still exists, but it’s inverted: It’s 0.03 more points more effective to let the Clippers play on than to foul Jordan. You can see how we got here in the chart below. While the Clippers’ free-throw rebounding prowess may decline in the postseason, and their incredible post-free-throw rebound efficiency may be a product of a relatively small sample size of possessions, it’s clear that the intentional-foul strategy is not a sure thing. Of course, every team and every poor foul-shooter is going to have their own break-even points. Dwight Howard, for instance, is a 54.7 percent free-throw shooter this year, so the Rockets expect 1.09 points every time he gets two free throw attempts. But that’s without accounting for the other factors in play — and we do know that those factors matter for all teams. The Rockets might rebound Howard’s misses at a different rate from the Clippers, or play worse defense after missed free throws. It’s just a matter of calculating them. For opponents of Jordan and the Clippers, though, the lesson seems clear: Neither strategy is superior to the other. Over the small sample size of two, four, or six free throws shot by Jordan in a given playoff game, the Hack-A-DJ strategy could look brilliant or foolish. But if the intentional-foul strategy isn’t working against the second-worst free throw shooter in the league, then it may not work against anyone. For fans of an uninterrupted game, that would be a welcome shift. The basketball blog A Screaming Comes Across the Court did a great job of quantifying the offensive rebound value in a post in February. Of course, every team is less efficient when you strip out fast breaks, the easiest points in basketball.